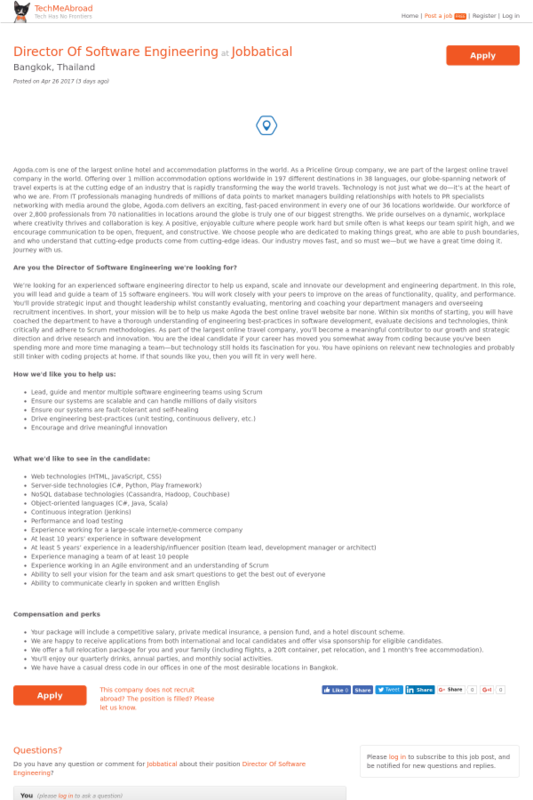 Are you the Director of Software Engineering we're looking for? We’re looking for an experienced software engineering director to help us expand, scale and innovate our development and engineering department. In this role, you will lead and guide a team of 15 software engineers. You will work closely with your peers to improve on the areas of functionality, quality, and performance. You'll provide strategic input and thought leadership whilst constantly evaluating, mentoring and coaching your department managers and overseeing recruitment incentives. In short, your mission will be to help us make Agoda the best online travel website bar none. Within six months of starting, you will have coached the department to have a thorough understanding of engineering best-practices in software development, evaluate decisions and technologies, think critically and adhere to Scrum methodologies. As part of the largest online travel company, you'll become a meaningful contributor to our growth and strategic direction and drive research and innovation. You are the ideal candidate if your career has moved you somewhat away from coding because you've been spending more and more time managing a team—but technology still holds its fascination for you. You have opinions on relevant new technologies and probably still tinker with coding projects at home. If that sounds like you, then you will fit in very well here. Do you have any question or comment for Jobbatical about their position Director Of Software Engineering ?